In creating all the spaces at the Ace Hotel New York, Roman and Williams envisioned a contrasting dialog and embraced the unexpected idea that one firm would conceive and combine such varying spaces. 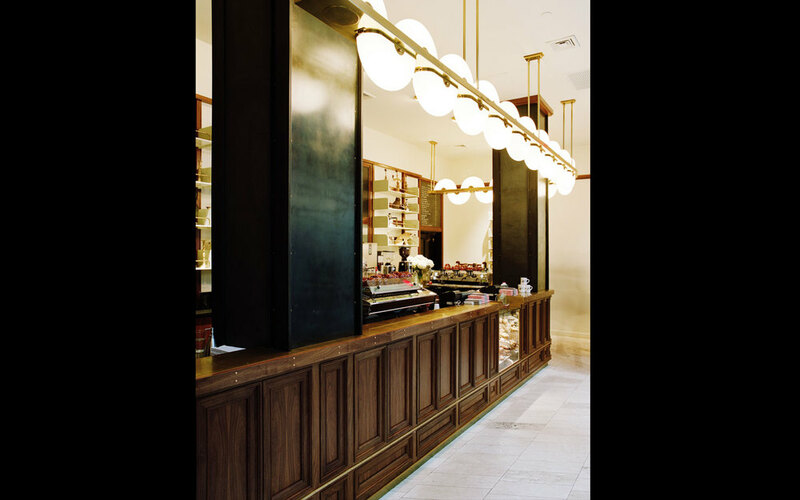 Situated in the lobby, the New York outpost of the trendy Portland-based Stumptown Coffee is a more sparse endeavor than the other spaces in the hotel, but still delivers maximum impact. The space is dominated by a large undulating custom light fixture inspired by Milan in the 1960’s, trimmed in brass and running the length of the space. The light first expresses itself on the street and is an interesting contrast to the early 20th century marquee. The travertine floors and brass detailed walnut bar complements the lighting. The high-gloss painted wood shelves are stacked with juicers, jars, and other necessary items for the coffee lover. Chalkboard menus further the tactile vibe. Even the baristas, outfitted in vests and funky hats, fit seamlessly into the space.